Angie Macias wrote this post. She’s a Cornell student who took my Mushrooms class in 2012, and we’ve been lucky to have her help at Cornell Plant Pathology Herbarium. Writing poetry is my weak point. That’s why I was excited but nervous to hear that my creative writing class had a ten-page poetry requirement. I considered my subject as I walked to work at the Herbarium that afternoon– the topic that came to my mind was dirt: I had just come from a soil science class. But something was missing… the poem had no life, literally. Writing a poem about sand particles wasn’t cutting it. That was when I thought of the cicada. Every summer at home in South Carolina, the evening air was alive with their calls. My black Labrador, Molly, loves to eat them, and she especially enjoys digging up their soil-dwelling nymphs. The cicadas I knew then were “annual” cicadas: an individual nymph takes 1-4 years to mature underground, but there is a hatch every year. The nymphs feed on the sap of tree roots, and somehow all those ready to hatch in a given year do so at nearly the same time. That was about the extent of my knowledge of cicadas, so I did a little more research on their life cycles. As it turns out, the annual cicadas are not alone. Several other species—the periodical cicadas— have 13 or 17-year life cycles, emerging en masse in overwhelming numbers, presumably to reduce the impacts of predators. But one predator, the fungus Massospora, has evolved to wait with them for all those years. The State Mycologist for New York, Charles Horton Peck, published the first official description of this fungus in 1879. “This is a peculiar genus,” he was quick to point out. “In its early stage it is wholly concealed in the body of the insect, but just before, or soon after the death of the insect, the terminal rings of the abdomen fall away, revealing the pulverulent mass of spores within…” That’s right, this little white fungus eats the cicada alive until nothing is left in its abdomen but spores. Then it ruptures the tissues holding the abdomen together, breaking the end off, and thereby turning the still-alive-and-flying cicada into a salt shaker of death for others below. How did this genus of fungi evolve? How did it learn to rest for years in the soil, and how does it know to emerge with the cicadas? I couldn’t find any answers. Very little research has been done on this fungus and its unwilling partners, so I set out to do my own. 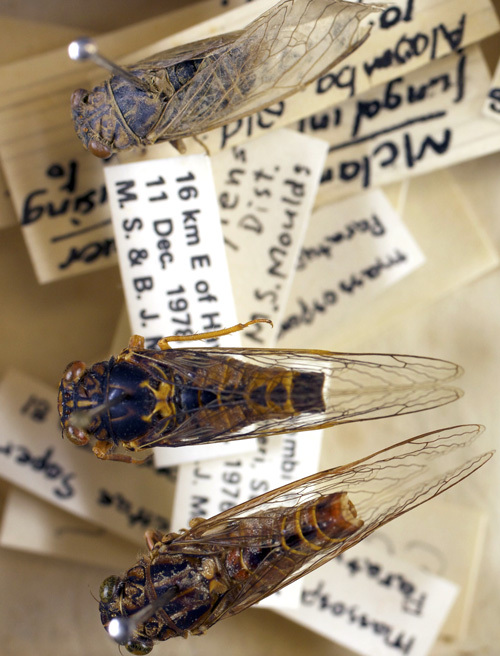 In the Cornell Plant Pathology Herbarium, I found twelve species of Massospora infecting sixteen species of cicada, from at least eight different countries scattered around the globe. One was found in Honduras in 1923, another in the US some years later, and then many more, in places like Colorado, Afghanistan, Argentina, and Australia. Based on this range of locations, I believe that Massospora can be found wherever cicadas are (which is pretty much everywhere). It may have evolved alongside the insects, with the cicada trying to outsmart the fungus by developing its lengthy life cycle. Then, the fungus may have followed suit, learning the signals the cicadas used to choose when to emerge. Or perhaps the cicadas developed their life cycle to fight off some other threat, like the muscoid flies that parasitize some species, and the fungus simply took advantage of the opportunity. No one is sure. Richard Soper studied Massospora here at Cornell, completing his PhD in 1974 and moving on to a productive career with the USDA’s Agricultural Research Service. His exacting work sheds light on Massospora life cycles. 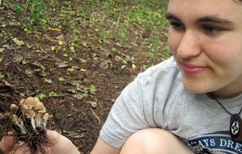 He examined over 8000 underground nymphs of an annual cicada species, and found none infected. His work suggests cicada nymphs are first infected as they dig tunnels to the surface some days before emerging for their transformation into adults. This first group of cicadas, infected in their tunnels, will die during the time they’d normally mate, while producing spores than can directly infect other cicadas. But the second group of cicadas—those infected on the wing—will die filled with thick-walled resting spores. Resting spores are entrusted with the long wait in the soil til the next generation emerges, a year or perhaps 17 years down the road. Lots of people hate cicadas for the racket they make in summertime, but we stand to learn a lot about biological clocks and environmental signaling from them and their fungal enemies. The fungus could bring economic benefits as well: cicadas cause significant damage to small trees with their egg-laying habits. Nearly all of the specimens I found in the herbarium were type specimens (the original one used to define a species), so I’m afraid that so far the scientific interest in them seems to be only in the naming. When I go home this summer, I’m going to test the patience of my parents a little more by not only bringing the usual handfuls of mushrooms into the house, but handfuls of dead cicadas as well. I might get lucky and find one with a Massospora infection, and if I do, I’m going to study it well and send it back to Cornell for safekeeping. Maybe when I can get a really good look with a microscope, I’ll learn something new about this murderous little fungus to enliven my poem. Angie Macias is a student worker at the Cornell Plant Pathology Herbarium. She’s worked on two of our NSF-funded projects: first, to digitize the voluminous fungal collection of George F. Atkinson, and lately, to photograph our type specimens (over 7000 of them!). She’s also a big fan of fungi and has a nice crop of oyster mushrooms growing in her room. Editor’s Note: You can read about Massospora’s insectivorous kin elsewhere on this blog–they will make you glad you are not a bug. Top: Rear end of a periodical cicada turned salt shaker of death by Massospora cicadina. Image by Kent Loeffler. Middle left: Massospora cicadettae infecting Cicadetta murrayiensis and Cicadetta puer. New South Wales, Australia, 1978. Image by Angella Macias. Bottom: Massospora spinosa infecting Quesada gigas. Venezuela, 1967. The abdomen of this greenish species would normally extend almost twice this length. Image by Angella Macias. Species described in Massospora. Index Fungorum. Accessed 21 October 2012. Cicada Central [an interesting website that celebrates and supports the study of cicadas]. By Chris Simon’s Lab at the University of Connecticut. A.T. Speare. 1921. Massospora cicadina Peck, a fungous parasite of the periodical cicada. Mycologia 13: 72-82. R.S. Soper, Jr. 1974. 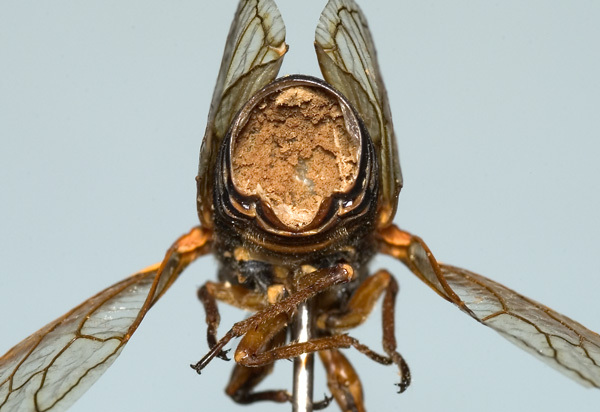 The genus Massospora Peck entomopathogenic for cicadas. Dissertation, Cornell University. R.S. Soper, Jr. 1976. 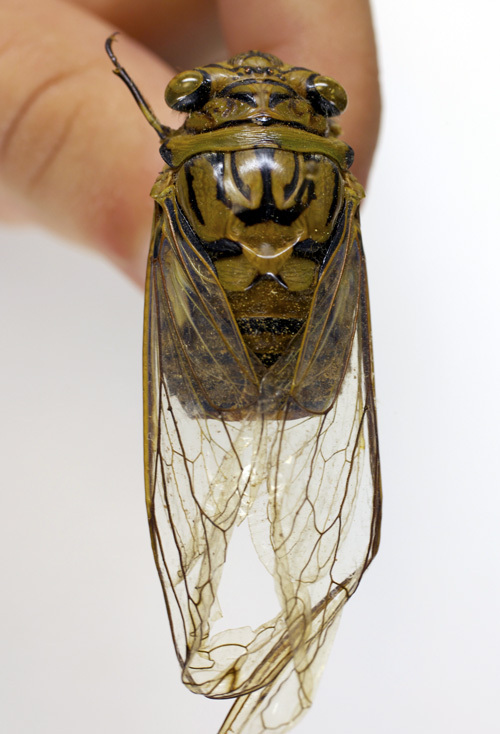 The genus Massospora entomopathogenic for cicadas. Part II. Biology of Massospora levispora and its host Okanagana rimosa, with notes on Massospora cicadina on the periodical cicadas. Annls Entomol. Soc. Am. 69:89-95. Editor’s Note no. 2: We are grateful to the National Science Foundation for funding digitization work at the Cornell Plant Pathology Herbarium. Their support has meant we could hire Angie and a crew of other talented students.